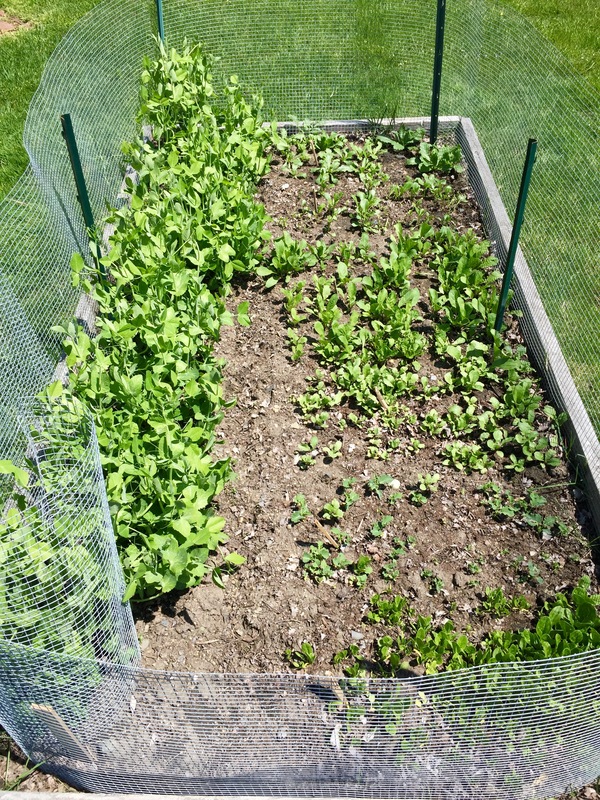 With a week of rain followed by a week of sunshine, the garden has really taken off. Nights are still too cool (in the 40’s) for tomatoes to go out, so they’re hanging out in my greenhouse until they’re ready to be transplanted. 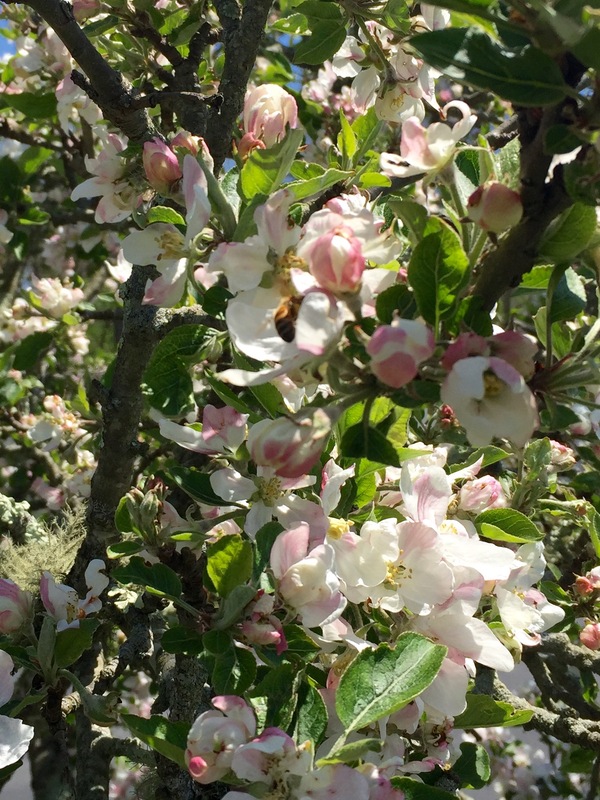 Happy bees buzzing around the blossoms of my old and still productive apple tree. 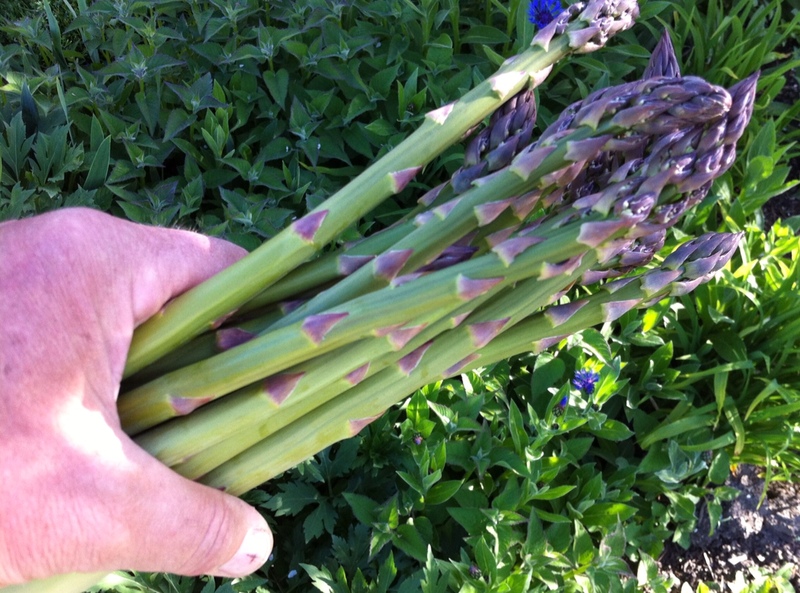 Strawberries and asparagus share the same bed. 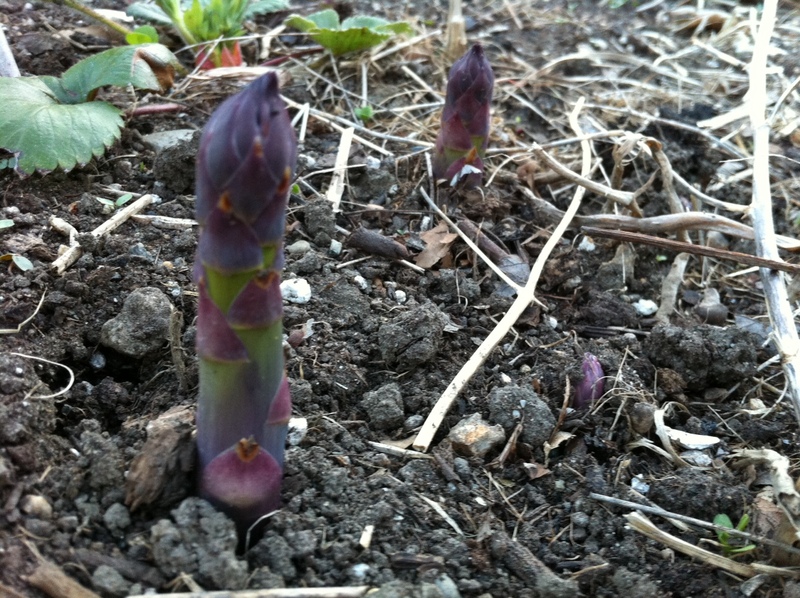 A good combination: by the time the asparagus harvest is over, the strawberries fill in the bed. 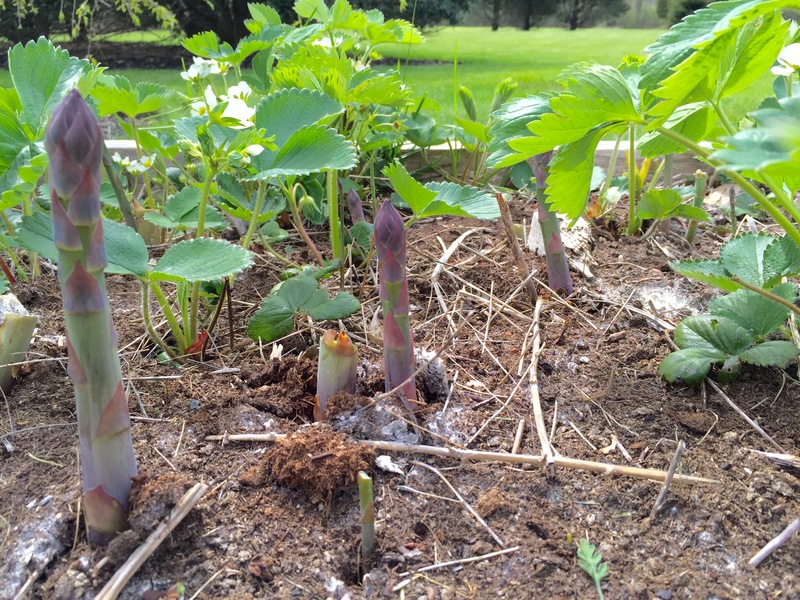 And by the time the strawberries are all picked, the asparagus stalks shoot upward to produce the ferns that will recharge the plants for next year’s crop. 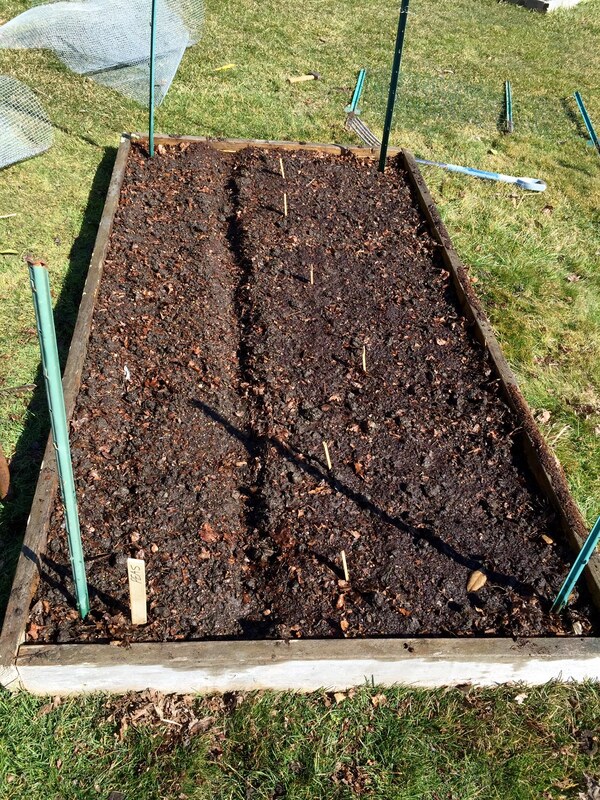 …And a check on the first bed I sowed this season: peas on the left, happy arugula, Asian greens, lettuce, spinach and more on the right. 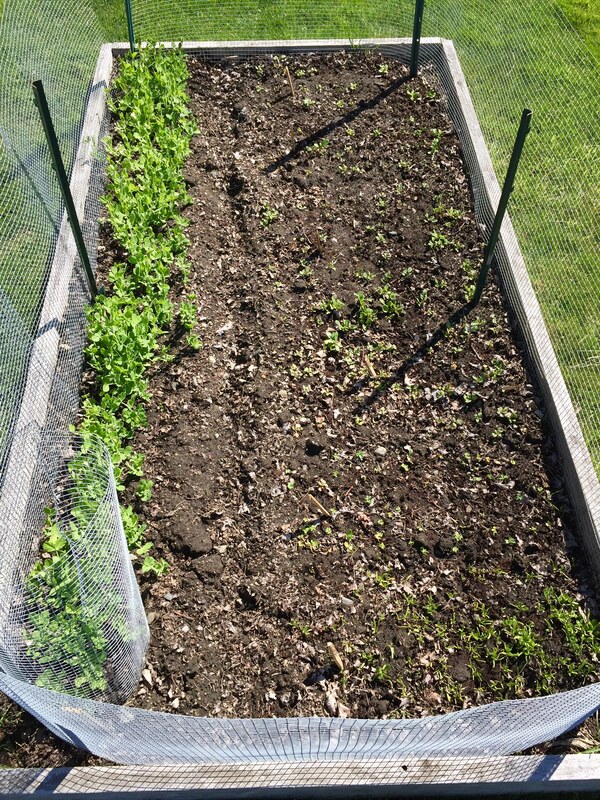 Fresh salads from the garden have already included: lettuce, Asian greens, scallions, arugula, spinach, asparagus, pea tendrils, fresh oregano, and kale. 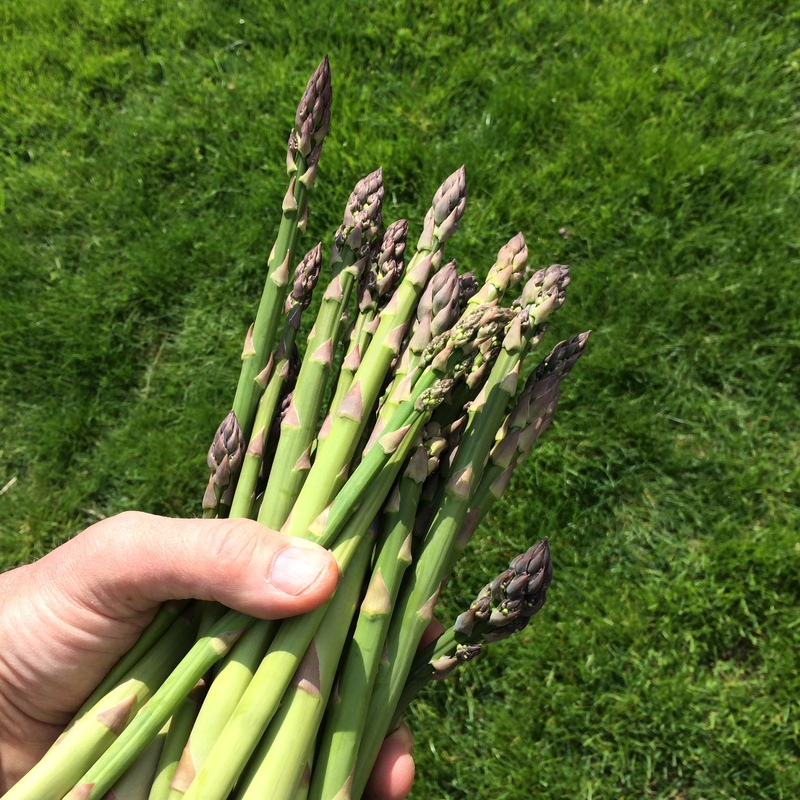 Asparagus season has arrived in my garden. This is one of my favorite ways to enjoy it. Have the pasta water boiling, and add pasta, cooking until just a bit more undercooked than al dente. 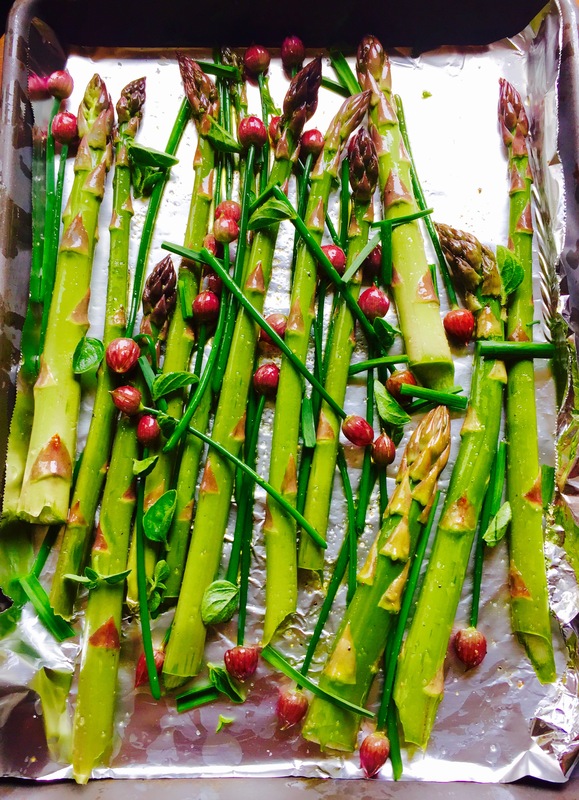 Return the pan to the stove, add a little more olive oil, and on medium heat, saute the asparagus pieces. Cook until they are al dente, not too soft. 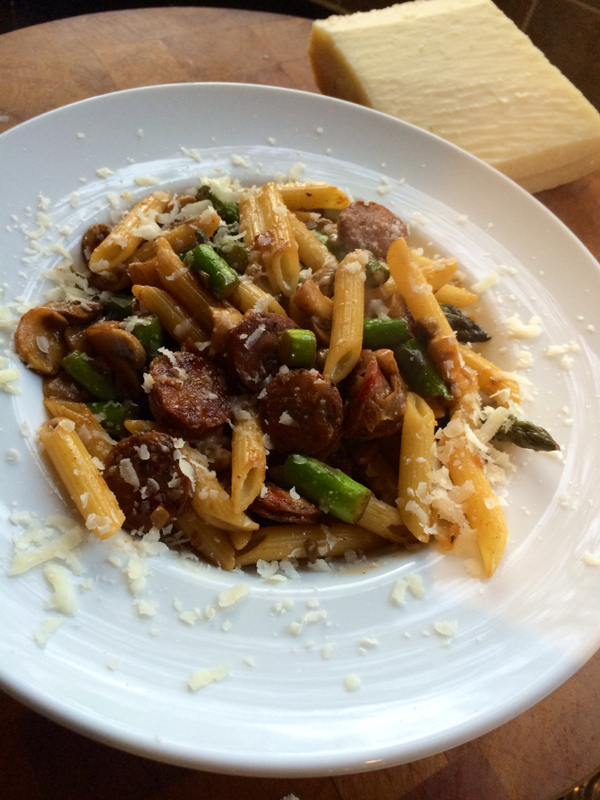 Once the asparagus has reached this stage, return all the contents of the sausage/mushroom bowl to the pan to heat through. Drain the pasta, and add it to the pan as well, combining all the ingredients. If it looks too dry, add a little pasta water to the pan. Season with salt and pepper. Heat a large pan, and drizzle in some olive oil. Sautee sausage pieces until browned and cooked through, but not over cooked. Remove sausages from the pan and place in a separate bowl. Remove all but 2 tablespoons of the fat left behind in the pan. Place pan back on stove and saute onions until translucent. Add garlic, and saute for 10 seconds. Add sage, and saute for 10 seconds, stirring. Add chopped mushrooms and saute for a few minutes, then add chicken broth, and simmer until almost all the liquid has evaporated. Pour contents of the pan into the bowl with the sausages. Return pan to the stove, add a little more olive oil, and on medium heat, saute the asparagus pieces. Cook until they are al dente, not too soft. Once the asparagus has reached this stage, return all the contents of the sausage/mushroom bowl to the pan to heat through. Drain the pasta, and add it to the pan as well, combining all the ingredients. If it looks too dry, add a little pasta water to the pan. Season with salt and pepper. 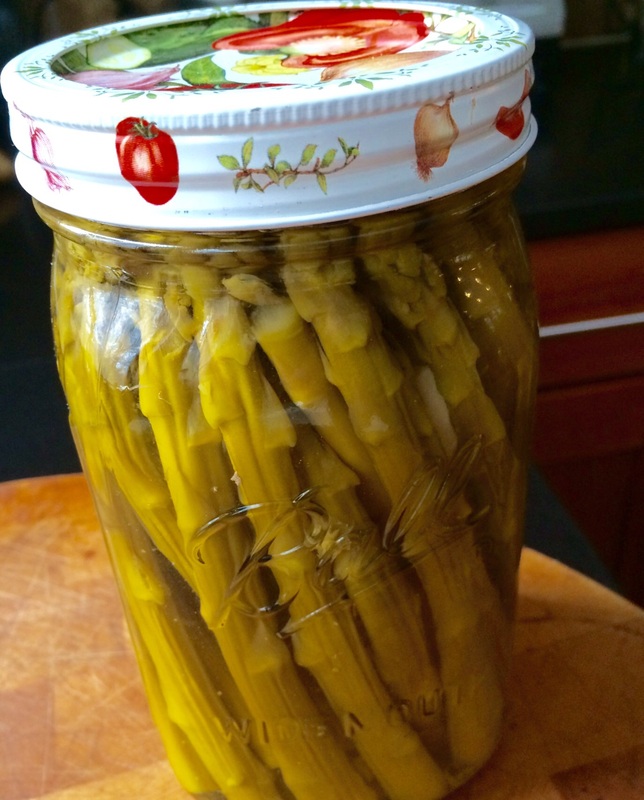 Trim bottom of asparagus spears so that spears are just slightly shorter than the height of the quart-sized Mason jar you will use. Or cut into pieces that will fit smaller jars. 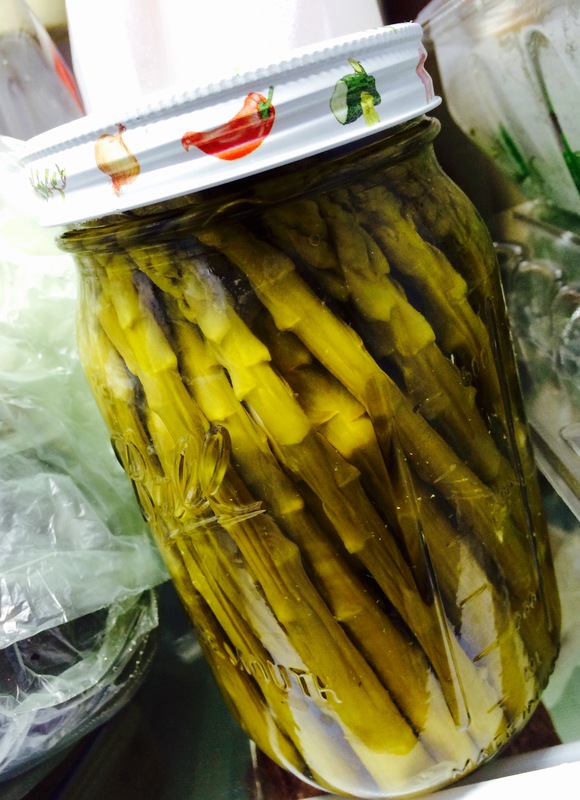 Pack jars as tightly as you can with asparagus spears. (They will shrink when processed.) Add garlic clove and 1 teaspoon of salt to every quart-sized Mason jar…less for smaller jars. Fill jars with vinegar mixture and seal. Process jars for 10 minutes. Let cool before placing in refrigerator.